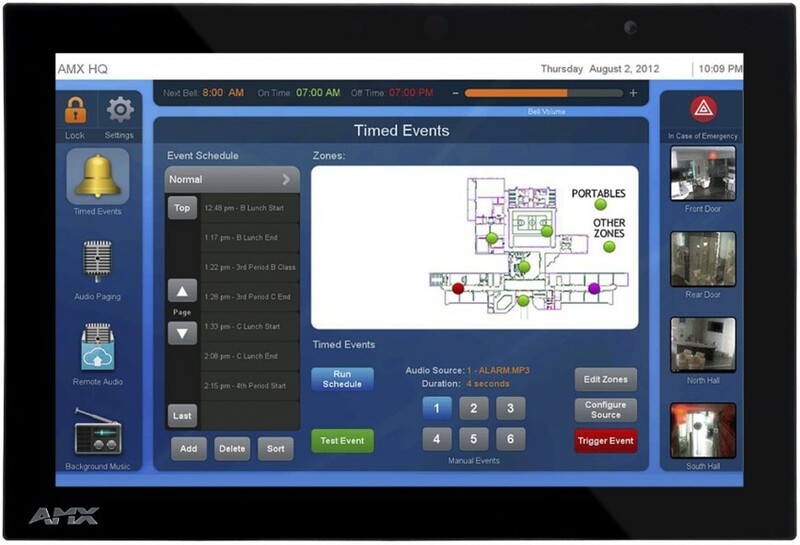 SchoolView Bell & PA consolidates multiple systems including bells, PA/intercom, remote audio, background music, and security camera feeds into a simple, user-friendly interface over a single network. 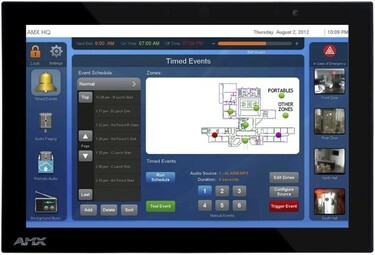 The system integrates a bird’s eye view of campus floor plans for creating zones or selecting a single and/or groups of rooms for bells and communications. The easy to understand user interface on the administration control panel is designed for the non-technical user to create and modify bell schedules. Everyone will find it easy to make announcements, and create paging zones without calling for help or opening a manual. Communication with a network time server ensures that your bells always ring on time and are synchronized with your IP clocks. Emergency audio messaging can be sent to all locations with a touch of a button on the control panel, or from virtually anywhere using your tablet device. Use in conjunction with SchoolView Bell & PA hardware in each room for a total solution. The SchoolView Bell & PA package includes a NX-1200 fully loaded with the SchoolView solution. For every 12th room an additional NX-1200 is required. The SchoolView Bell & PA system consolidates multiple systems including bells, PA/intercom, remote audio, background music, and security camera feeds into a simple, user friendly interface over a single network. The system integrates campus floor plan maps for creating zones for selecting a single and/or groups of rooms for bell and communications. SchoolView Bell & PA simplifies your bell schedule, uses standard MP3 bell tones, and synchronizes bells with IP clocks.